January is the traditional time to post a year-in-review piece, but for me, the start of the sowing and growing season – with the last of the previous year’s over-wintered veg crops being harvested or cleared away and the first of this year’s plants being sown and planted out – seems a good time to think back on what went well and what wasn’t such a success. Last year was an odd one: we moved house (eventually) at the end of July, which meant that from March through to October – almost the entire growing season – we were doing a lot more sorting, skipping, packing, moving, unpacking, redecorating and recovering than we’re (hopefully) likely to have to do again for a very long time. Nevertheless, we still managed a pretty good all-round showing. Last year we deliberately grew far too many potatoes in order to help condition and turn over a massive, newly-cleared section of the plot; almost an entire quarter of the total space. Our ‘swift’ first earlies were great, as were the ‘saxon’ second earlies – which we actually harvested as main-crop and turned out to be an excellent all-rounder – and ‘pink fir apple’ main-crop. We had so many of these latter two varieties that we were still eating them well into February, until they started shooting like crazy and depleted their starch stores. Knobbliest pink fir apple contest? We have a winner! Our fourth variety was ‘Golden Wonder’ which grew reasonably well, albeit with smaller yields than the other three, but turned out to be less useful from a culinary point-of-view. Their extreme starchiness meant they were okay as roasties or oven-baked wedges, if you didn’t mind the uber-crunchy exterior and quite dry interior, but rather useless for anything else; you just have to wave them in the general direction of a pot of boiling water and they start to dissolve, so you can’t even par-boil them. I even tried making crisps with them… frankly, not worth the effort. Ah, well. We had a pretty decent harvest of regular garlic, the elephant garlic was excellent (double the amount is already planted out and growing on for this year), our ‘Musselburgh’ leeks grew well – they’re still going strong and are very tasty with it – and the brown onion ‘sturon’ sets, that one of the old boys donated from his surplus, did well. I love beans. I love growing them, harvesting them, cooking with them and eating them. 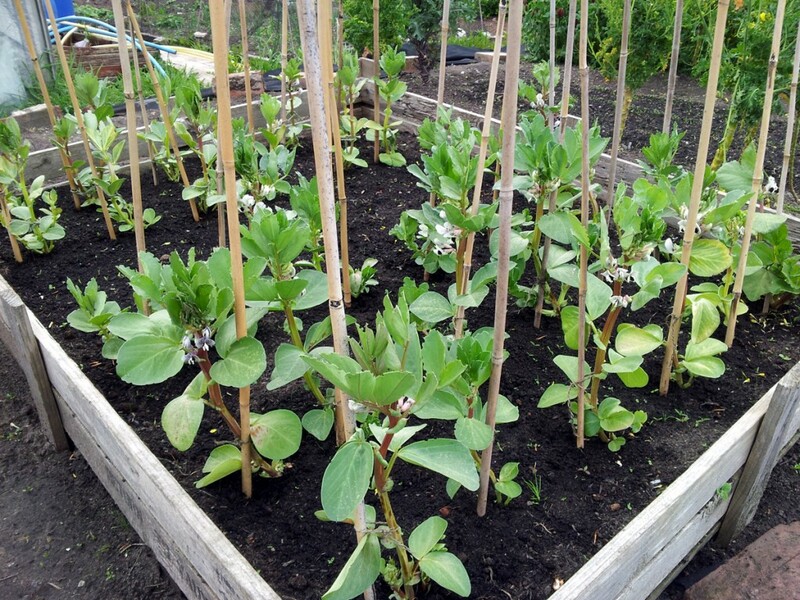 Last year we grew broad beans in Spring and then runner beans (scarlet emperor), climbing French beans (borlotti and fasold) and dwarf beans (cannelini) in Summer. 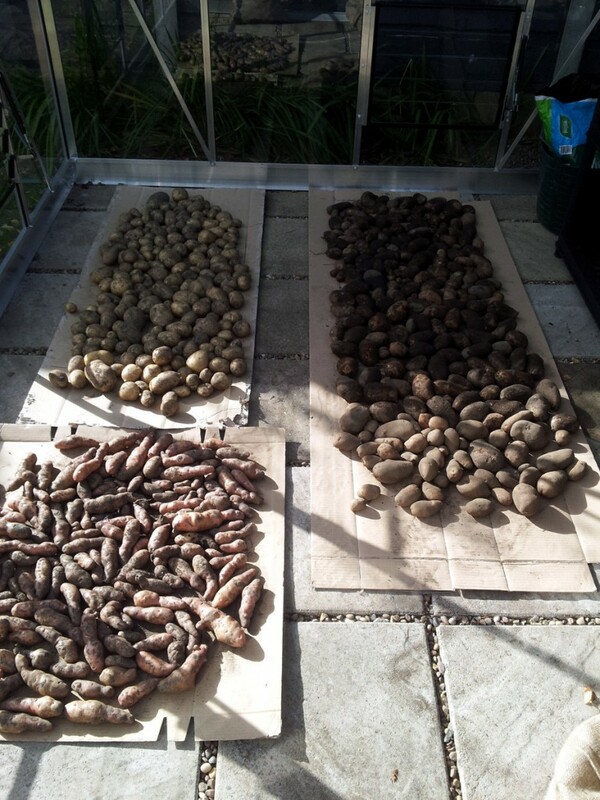 All of them did very well indeed and we managed to fill a freezer tray with pods and a couple of tubs with dried beans for the winter. The one failure was the variety I tried to grow as part of my ‘three sisters’ (squash / sweetcorn / beans) companion planting section. Not wanting to plant anything too vigorous, I went for a dwarfing purple variety, which were almost totally swamped by the masses of squash foliage that I didn’t have time to control. This year: a climber, and more pruning. Around a quarter of our plot is planted up with soft fruit bushes and rhubarb, many of which were newly-transplanted from home or elsewhere on the plot at the end of year one, so we weren’t expecting anything amazing in their first full year. We were surprised and delighted though by bumper crops of blackcurrants, raspberries and rhubarb, all of which featured heavily in my jam-making. We also had an excellent blueberry harvest from our two potted bushes in the back garden. No jam there though, they barely made it inside the house. Our gooseberries and redcurrants were less impressive but still put in a good effort; the bushes should do better this year. Still to perform (hopefully this year): whitecurrants, Japanese wineberry and loganberry. It was an awful year for our strawberries. The previous November we planted up three ridges, with a dozen plants on each, and looked forward to the glut to follow. What happened instead was a red-hot April that forced early blossom, followed by a cold, wet May which killed it all off again before it could be pollinated. Net result: three fruits. Not three kilos, or even three fruiting plants. Just three lonely little fruits. Here’s hoping for better growing conditions this year. The three varieties of cabbage – all pointy-headed types – that we planted did very well and we enjoyed them immensely. Our kale was good as well and over-wintered nicely, until the pigeons worked out that the new shoots were ripe for raiding. Our sprouts were a big disappointment: small, poorly formed buttons on spindly stems, barely a crop worth the name. I think I know where I went wrong: I kept them covered in enviromesh for too long, so they got a bit cramped as they were growing strongly over the summer. This year I’ll take the covers off sooner and plant them a bit further apart, too, to give them more room to stretch out. Because we couldn’t keep on top of the watering, our Romanesco broccoli bolted. It was still tasty as shoots/spears, but we didn’t get the tight, fractal-pattern heads. We’ll have another go this year and see what happens. And our purple sprouting broccoli was annihilated by the same pigeons (we assume) that did for the kale, back in February. Courgettes! 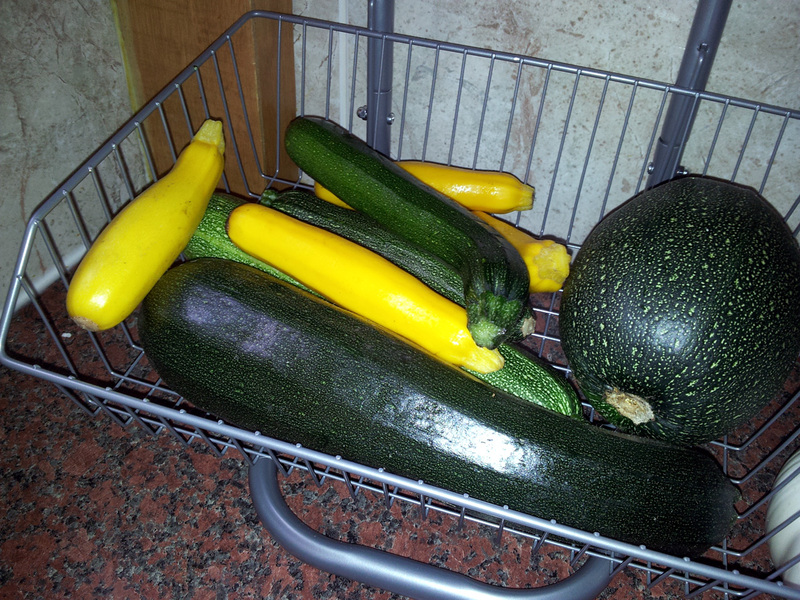 So many lovely courgettes. We grew four varieties and they all did extremely well; we were eating them from late Spring right through to mid Autumn. A superb crop, they pretty much take care of themselves and will keep on producing until the frosts start to bite. Highly recommended. Our sweetcorn did rather well, too. It was the first year that I’d grown it properly so wasn’t sure what to expect. When we ended up harvesting around two-dozen good-sized cobs from a dozen plants I was rather pleased. More of the same this year, I reckon. Courgettes! And one mini-marrow. And a round one on the way to a pumpkin. 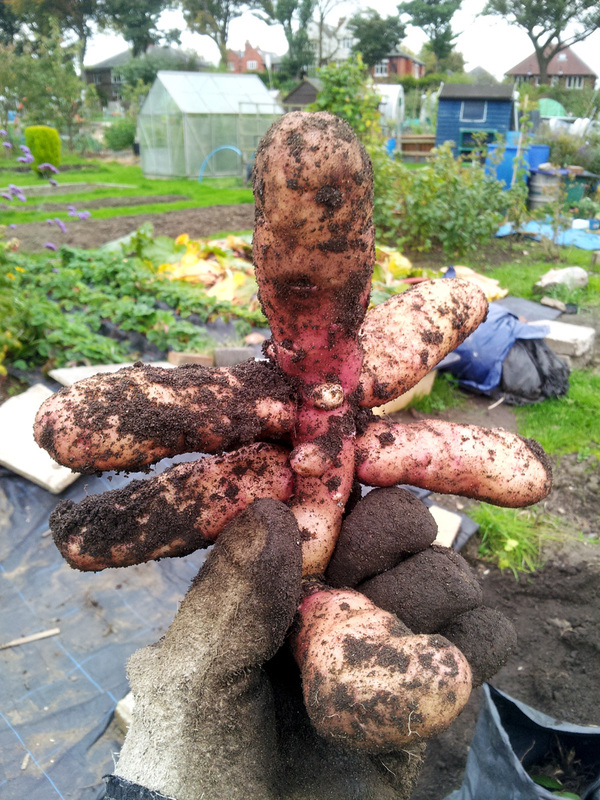 The ‘sweet dumpling’ squashes that we planted in the three sisters section didn’t work at all well. Again, it was down to a lack of time to keep on top of the masses of foliage that the vines produce; I didn’t cut them back soon enough or hard enough and they sprawled massively as a result, causing damp, humid conditions that rotted the fruits on the vine. More care and attention needed this year. We didn’t do all that much on the roots front, except to sow a few rows in a spare patch of ground just to see what happened. As it turned out, the parsnips and salsify did rather well, with the latter a very tasty revelation. We still have the last few parsnips in the ground; they’ll be coming up shortly. This strange, hairy stuff is salsify – rather tasty baked or sauteed in butter. Carrots. Ugh. They didn’t do at all well, we got nothing at all from the row I sowed. But then I didn’t do much soil preparation and didn’t take any precautions against carrot-fly. More and better of both this year. 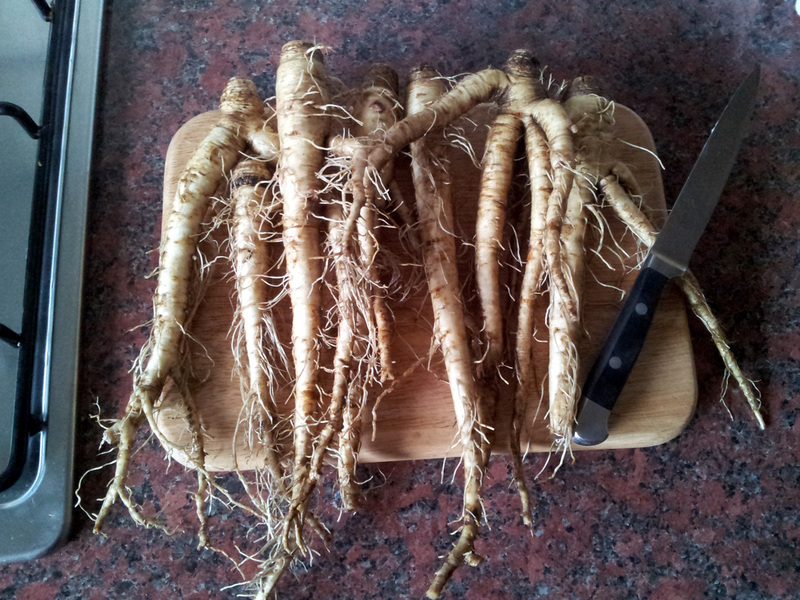 The celeriac was poor as well; sprouted greens but failed to set roots. I’ll have to read up on that one. Likewise, the celery plants that our next-door plot neighbour donated did nowt worth mentioning. To be fair though, I don’t know if they were a trenching or self-blanching variety, so just chucking them in and hoping probably wasn’t the best strategy. We didn’t grow our usual trays of greenhouse salad leaves last year, due to the uncertainty of the move, but what we did have made a fresh, tasty change from supermarket lettuce. I didn’t go in for peas much either – I usually do pea shoots at home for salads and mange tout in tubs, as well as down the greenhouse – but those will feature more heavily again this year. No exotic or unusual fruit or veg last year (same reason as before), the chillis were a bit of a failure (I blame the wet summer) and the three bush tomatoes that I chucked in at the allotment didn’t do much (except sprawl through the courgette patch and make a nuisance of themselves) before getting blight-struck. So it goes. Fewer spuds, more elephant garlic and onions, hopefully a better fruit harvest, more (and better spaced) brassicas, even more beans, a new asparagus patch, improved squash-foilage control, more salads, greenhouse and outdoor tomatoes, plenty of chillis, a few exotics, an actual carrot harvest (hopefully), and all sorts of other stuff.